Some 1,200 families/structure owners and approximately 4,800 individuals in Damayang Lagi, along E. Rodriguez Avenue in Quezon City are currently threatened with dislocation from their homes if the government’s mixed use plan for the area will be implemented. Some of the residents there had built their homes on that land in 1960’s and 1970’s. In the name of development, profit maximization, additional revenues for the city, and for aesthetic reason, the Quezon City government under Mayor Sonny Belmonte plans to transform the 21,000 square meter-Damayang Lagi into a commercial and residential site. A mixture of permanent and semi-permanent structures of urban poor or informal settlers are currently erected in that site. Commercial building will be constructed in the area along E. Rodriguez Avenue while the medium rise buildings (MRBs) for residential units will be built behind the commercial buildings or in the inner areas. Damayang Lagi land is owned by the Department of Finance (DoF) through its Privatization and Management Office (PMO). It used to be the Magdalena Estate that was used as loan collateral (?) to the Development Bank of the Philippines in the 70’s. But it was foreclosed by the bank in 1977. There were several attempts to redeem the land, but all these failed. The DoF’s valuation of the land when this was bid out in December 1997 was PhP 23,000/sq.m. The area was declared by the DoF as Area for Priority Development (APD) consistent with Ferdinand Marcos’ Presidential Decree 2060 which identified Damayang Lagi as one of the priority areas for development in Quezon City. In fact, it was the 10th priority area then during the time of Marcos. The land was later classified under the Asset Privatization Trust (APT) during the Aquino administration, which targets various lands for disposal to generate additional revenue for the government. There may be some irregularities/questions with regard to the land classification of Damayang Lagi which may affect the QC government’s plan for the area. From 1970’s until 2001, Damayang Lagi had been classified as a residential land. However, in 2001, under Mayor Belmonte, it was classified as a commercial land under zoning ordinance or land use plan of Quezon City. 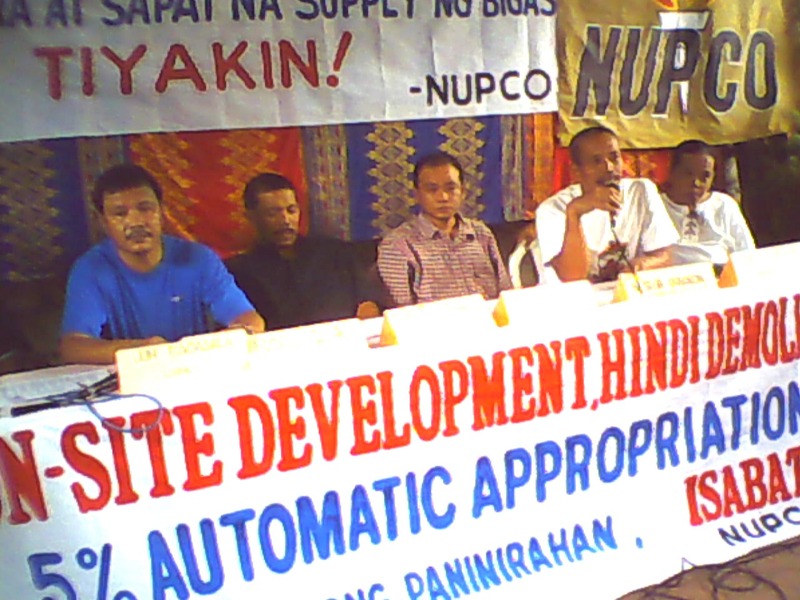 The community and the Barangay Council oppose the commercial land classification of Damayang Lagi. In effect, the whole community of Damayang Lagi is vehemently opposed to the commercial classification of their land by the Quezon City government. However, the communtiy believes that their will was overpowered by the influential Chamber of Real Estate and Builders’ Association (CREBA). In pursuing its opposition to the reclassification of Damayang Lagi from residential to commercial, the Barangay Council of Damayang Lagi passed a resolution in 2005 seeking the classification of the land to be reverted to its original classification as residential land. Councilor Intong sponsored this resolution at the City Council, but the Committee where the resolution was referred to has still not acted on the resolution. After three years, the affected community revived its opposition to the impending demolition of their houses due to the zoning ordinance of Quezon City which reclassified their land as commercial. In fact, several groups have emerged to pursue the protest against the plan to implment the mixed use of the land as commercial and residential sites. These groups are asserting their right to be there, where they grew up and have families of their own, and most especially their right to a dignified life which include a decent housing for them. These groups include the National Urban Poor Coalition (NUPCO) members in the area – Umalab Ka, Pagkakaisa ng mga Naninirahan sa Tabing Ilog (PANATA), Damayang Lagi Muslim Community, Nagbubuklod sa Damayang Lagi (NAGBUBUKLOD), and Nagkakaisang Samahan sa Damayang Lagi (NASADALA). In April 2008, a new alliance called Task Force On-Site (TF ON-SITE) was formed to pursue the on-site development position. 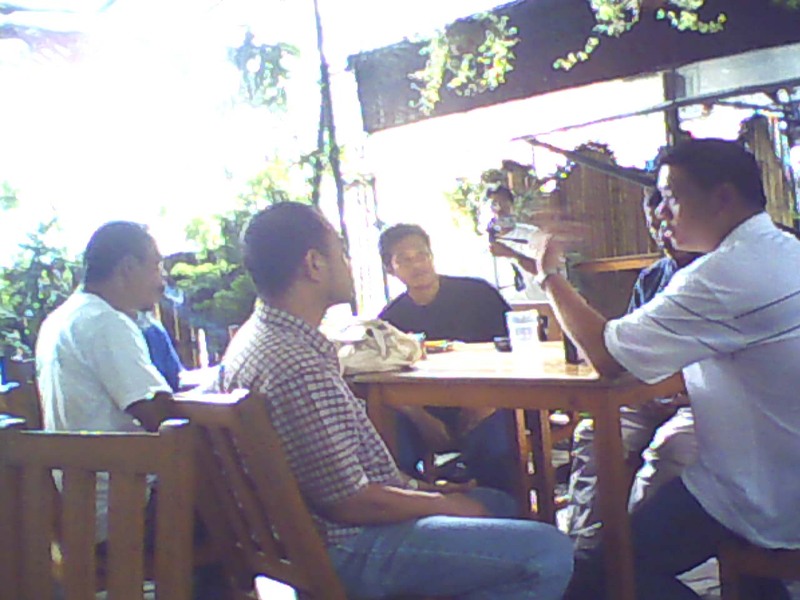 Its members include PANATA, DL Muslim Community, NAGBUBUKLOD, NASADALA, and the Barangay Council. The Barangay Development Council and the Chair of the Committee on Urban Poor of the Barangay Council who is also the president of PANATA act as co-coordinators. NUPCO sub-area coordinator Noel Cano of Umalab Ka is the adviser of PANATA and NASADALA. TF ON-SITE opposes the mixed use plan of the city government. The group anticipates that the plan will result in costly, thus unaffordable housing for its members. Also under said plan, their houses, in which many have already invested a lot, will be demolished. 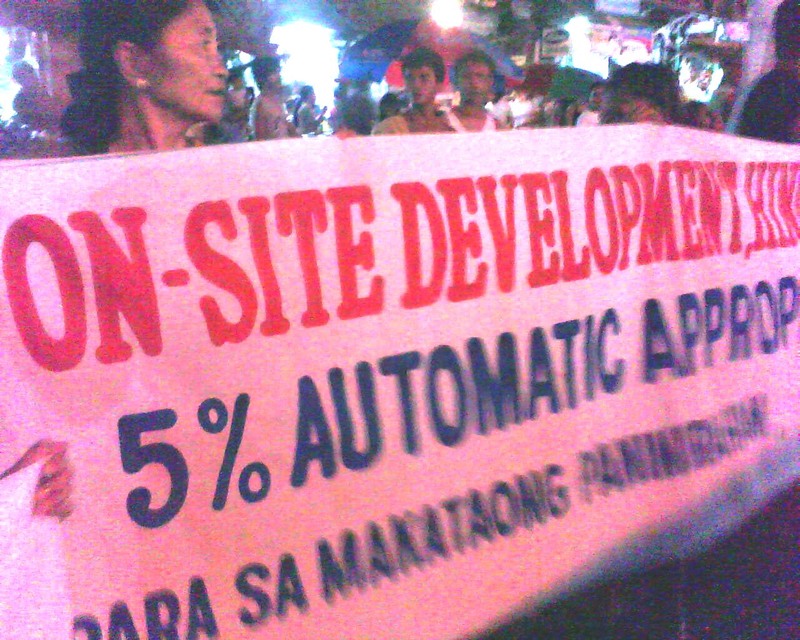 The alliance in stead demands an on-site, “as is, where is” development in Damayang Lagi. Moreover, TF ON-SITE members have expressed willingness to pay for the land just to have a security of tenure in the area. The medium rise buildings (MRB) option is not being entertained by the residents because this is believed to be used to ease them out because of the payment cost that many of them may not be able to afford. Besides, these residents assert that they have long been structure owners in the area, thus they have the right to stay there. Meanwhile, Home Insurance Guarantee Corporation (HIGC) proposes to have an off-site relocation for the affected community in order to pursue the mixed use of land project in Damayang Lagi. The PMO (owner of the land) and the Quezon City government (as developer) have ongoing talks for the so-called development of Damayang Lagi. The Asian Development Bank supports this plan through its Metro Manila Urban Settlement Project (?). The city government had conducted a census on November 2007, in coordination with some people’s organizations (?) in the area, to determine the actual number of occupants and to have an economic survey there as well. PMO and ADB are expected to finalize the plan and present it to Mayor Belmonte in June this year. Belmonte targets to complete the project before his term of office ends in 2010.